More than five hundred tremors were recorded in the past two days in the Reykjanes peninsula, mainly in proximity of the area of lake Kleifarvatn, 24 km SSW of Reykjavík. Since Thursday an increase in the local seismic activity has been observed. Although most of the shakes are smaller scale events with a magnitude of less than 2 in the Richter scale, there were also more intense quakes, of which five with magnitude of 3 or above. The largest earthquake was recorded today at 5:27 PM, with a magnitude of 4.1, and another significant seismic event took place earlier in the morning, at 9:05 AM. 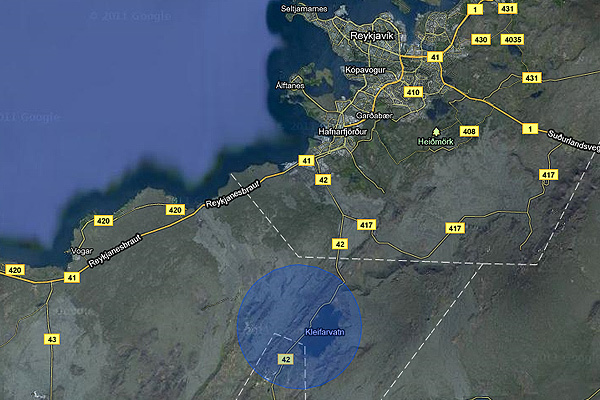 The area of the earthquakes, 24 km SSW of Reykjavík. For its geological connotations, earthquakes are not a rarity in Iceland. The currently interested area is situated in the middle of the Reykjanes peninsula, with the Mid-Atlantic ridge passing through it. The region is usually characterized by very active seismicity, but events bigger than those observed in the last few days are not likely to take place and earthquakes with a magnitude of above 6 are not expected. DV.is reports that Steinunn Jakobsdóttir from the Icelandic Meteorological Office stated that the possibility of an eruption cannot be ruled out, although this is not a certainty and thus there are not reasons at this stage to be alarmed. The last eruption in the area dates back to the 14th century, so right now there are few elements of comparisons for the experts to work with. You can follow further developments from the Icelandic Meteorological Office website, which is updated in real time. I’d half expect New Moon to pull the magma more, than a Full Moon, which tends to pull open faults. It is close to perigee, then eclipses come for summer. Trying times for Geological faults.